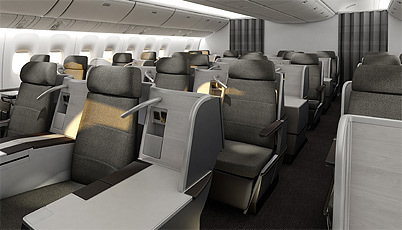 Ok, maybe that's taking a few liberties - but the new 777-300ERs (the biggest plane in their fleet) they're slated to receive are going to be considerably cozier than the current ones. The headline in the announcement focuses on the introduction of Premium Economy - a new class of service that will provide more legroom than regular economy seats, as well as a slightly-wider seat. It's a nice addition - certainly a more comfortable experience than they currently offer in economy, though it'll be interesting to see how much more it costs once the new planes are fully-integrated into the system. I want to focus on the changes Air Canada is making to their existing Executive First and Economy cabins though - because they're not pretty. They are setup in a 1-2-1 arrangement, which ensures that everyone has direct aisle access. It's a premium product I've been hoping to try for some time now. The new Executive First seat is actually a seat - and it's very similar to what SWISS, brussels, and several other airlines offer. From everything I've heard, it's also quite nice - but it does offer considerably less personal space than the suites. In this arrangement, there will be as many as 6 seats across (arranged in a 2-2-2 setup). The current 777-300ERs have 24 Executive First Suites between the first and second doors on the plane. The new version will have 36 seats in that same space - and 8 of those seats will not have direct aisle access. Ouch. I've always found that Air Canada offered a bit more room in their economy seats than most other airlines. 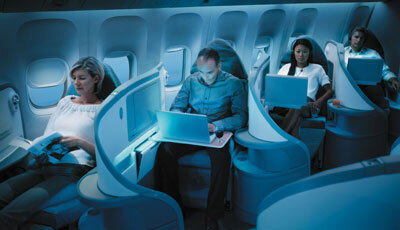 On their 777s, they currently have 32" of legroom and seats that are 18.5" wide, arranged in a 3-3-3 setup. That's not bad! Unfortunately, the new planes will be in a 3-4-3 arrangement - and their not getting any wider. As a result, seat width will shrink to a cozy 17" (for reference, Air Transat's seats are 16.5-18" wide, depending on the plane). As if that weren't enough - they're also cutting leg room down to 31" (though to be fair, that brings them more in-line with most other carriers). Sounds like a fun ride to me! If you've flown in economy on an Air Canada 777-300ER, I want you to think about how cozy it was on that flight. Got that visual? Now, ADD 100 PEOPLE TO THE PLANE - because that's what they're going to do. Total capacity will increase from 349 today to 458! You can compare the 2 configurations here. 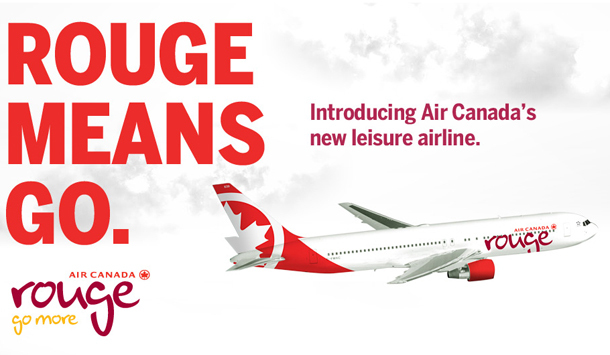 Forget rouge - Air Canada's NEW new leisure airline is... Air Canada! Sure seems like a downgrade to me, but Canadian friends - is this going to impact your choice when choosing who to fly for overseas flights in the future? Or am I getting all worked up about nothing? In my opinion Air Canada stinks. They've continually devalued their product, have terrible service, and are pretty expensive. Compare them with CX, SQ or TK and they're just miles behind,with no chance to improve. I agree with everything you've said - but I also felt like AC was generally a small step above the major US carriers (which admittedly, isn't saying much). Seems like they're trying to catch up on the crapiness factor! I have an upcoming flight and the main reason I chose Air Canada was the fact that the seats were more spacious. This will definitely impact my choice of airline for future flights. For the moment, the new seating arrangement is only supposed to be on 5 planes - so it shouldn't impact TOO many routes (yet).